Yes friends. It’s a thing. 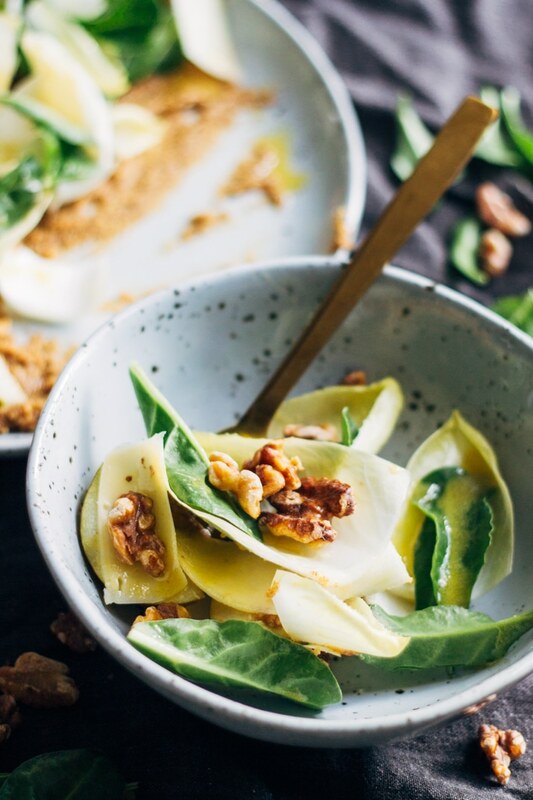 It’s a thing when you’ve been enjoying all that warming winter comfort food in your big woolly socks and big jumpers but you need a little crunchy freshness. A little sunshine. I’m not talking about making some try hard summer salad with imported avocados and watery hothouse tomatoes. I’m talking about a winter salad that owns it. 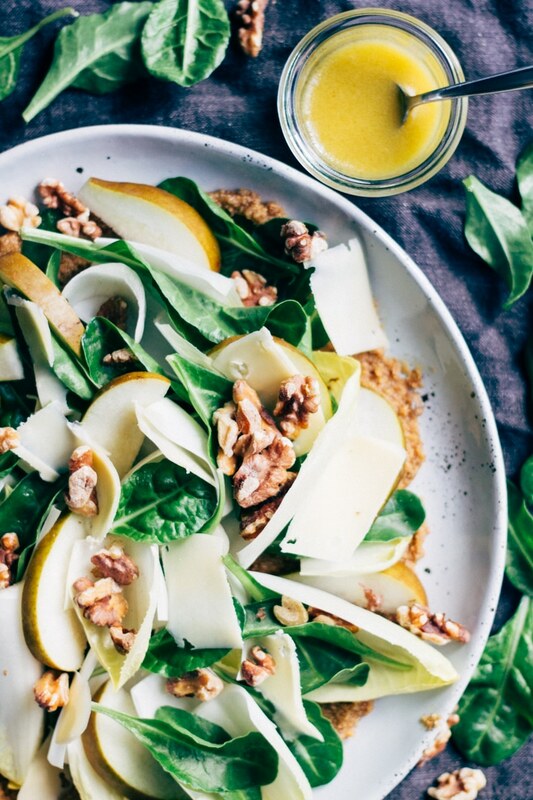 Crunchy and bitter witlof (endive), juicy pears, tender baby silverbeet, nutty shavings of Swiss cheese and a delicious creamy toasted walnut butter. So you haven’t seen me since Monday. I decided to have a few nights off this week and instead of doing my blog and indulged in my new obsession: binge watching Madam Secretary. Where have I been in the last three years? I’m a bit of a scaredy cat so it’s a little odd for me to be liking a bit of a thriller/drama like this, but I think it’s the really likeable characters and lack of too much gruesome stuff that has me hooked. Yes, I often have really good shows recommended to me and only get about 15 minutes into the series before being scared off for good, along with a few nights of bonus nightmares (The Americans, The Blacklist, Blindspot, Homeland and don’t get me started on Game of Thrones, eek!). I tend to stick to the Modern Family/Downtown Abbey/Gilmore Girls realm. One thing that does give me nightmares at the moment is what I am going to do when I get through the two seasons of Madam Secretary on Neon? Maybe you’ll see a few more recipes? Speaking of recipes (like that segway?). 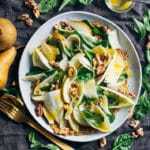 This Winter Witlof and Walnut salad. You guys! It’s crunchy, juicy, nutty, fresh and it has cheese… because we all love cheese. It’s bitter, creamy and sweet – the perfect balance! The best bit? A big smear of walnut butter (like crunchy peanut butter only made of toasted walnuts) on the bottom that you scoop up with the salad. I wish I would claim this genius, but it was inspired but a restaurant called Paris Butter down the road that I went to with some girlfriends recently (and thought was really good by the way). 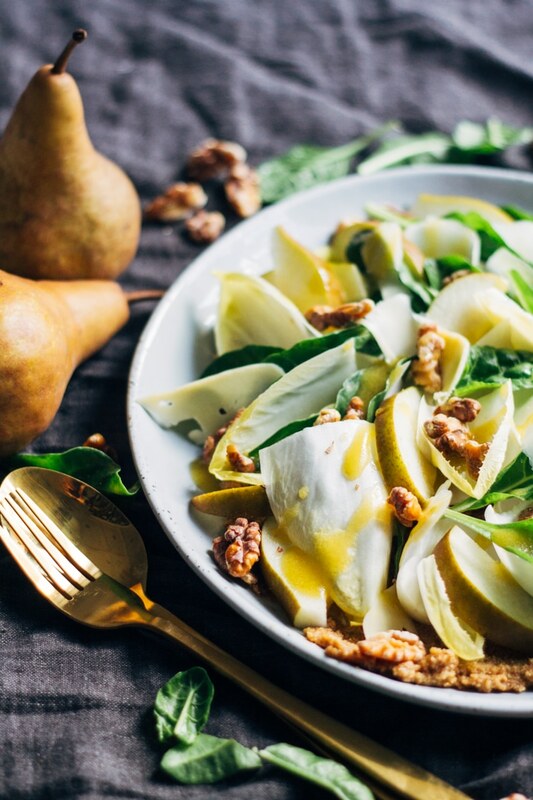 By the way, if you haven’t tried it before, witlof is just type of endive. So if you can’t find it, any bitter winter salad veggie like endive, chicory or radicchio will do. Preheat oven to 180C/350F on fan bake. 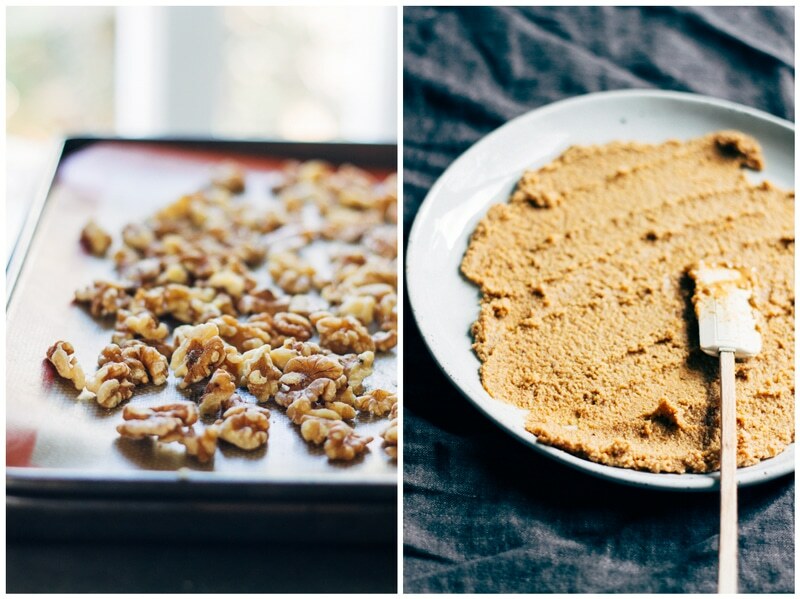 Scatter walnut pieces on a baking tray and place in the oven for 8-10 min until the walnuts are starting to brown and you can smell their aroma. Remove and allow to cool slightly. Reserve 1/4 cup of toasted walnuts for the salad. Place remaining 3/4 cup of walnuts in a blender or food processor with 1 Tbsp oil, pinch of sea salt and freshly cracked pepper. Process until a gritty paste. You still want some texture to it, not completely smooth. Smear on the bottom of your serving dish or bowl. 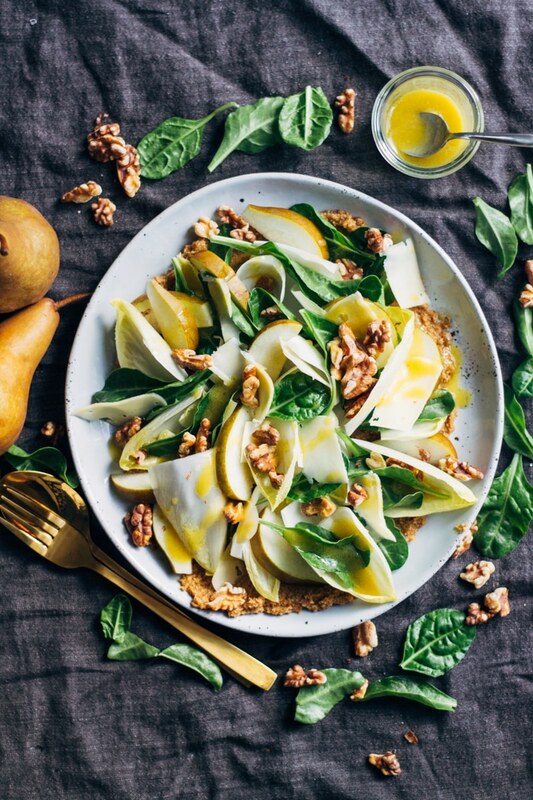 Slice the witlof leaves in half crossways then arrange with the rest of the salad ingredients on the walnut butter. Scatter over remaining toasted walnuts. To make the dressing, whisk together mustard, honey and lemon juice in a small bowl. Slowly drizzle in oil while continually whisking to create an emulsion. Season with sea salt and freshly cracked black pepper to taste. Drizzle the dressing over the salad and serve. Best eaten on the day. This looks like a beautiful salad… also, GOT for the win! Haha! You’re a braver man than I am Ben! Oooh the walnut butter on the bottom sounds super tasty! Can’t wait to try this! It is so nice! Just wish I could claim the genius idea. Thanks so much for stopping by, I hope you enjoy the salad.